Once Superdave and I raise my roof, and my confidence is higher, I'll gladly raise roofs for folks CHEAP. I'm gona work hard this year to get some property- then ITS ON, folks! Charles is a HELL of a guy- but I think folks spending TONS of money on these things are missing one of the big points of going the school bus route vs just buying a badass coach. I was thinking the same thing but I'm mobile so I can travel to you. got a place for me to park and ill help ya raise your roof. got welder will travel! Agreed. It makes my 2.5k FleaBay find seem downright reasonable. 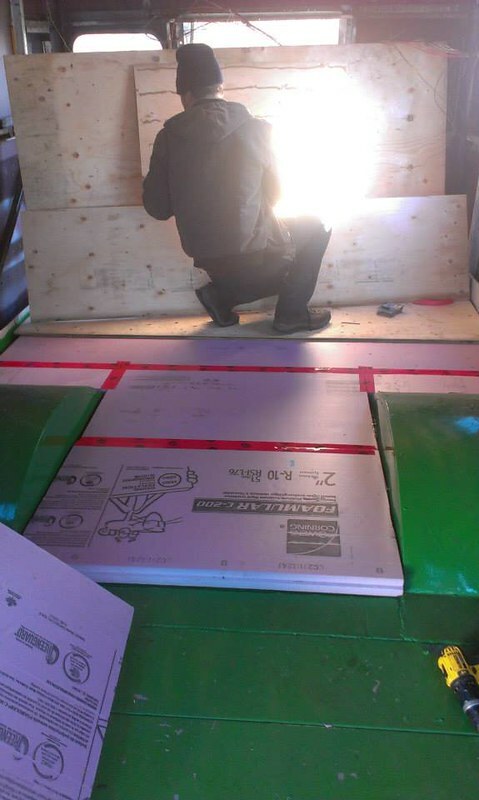 Has anyone considered or used the "Aluminum foil" type insulation used in Saunas to insulate their Skoolie? How did that work? Can you be more specific about what shiny insulation you're talking about? I recently built an indoor Sauna in my house. To add insulation properties to the walls I installed this layer of aluminum foil covered insulation that is meant to radiate the heat back into the sauna. It was placed over the normal insulation in the walls directly against the sauna walls. Works great. They come in rolls and before I added the tongue and groove boards the entire room was a silver shiny surface. Is that the reflectix I keep hearing about? Like bubbble wrap with either a single or double sided mylar? It should make a good vapor barrior, which is what you needed with an indoor sauna. It's not known in the bus world as being a cost effective insulation. I'm sure it's got its place. If it helps to visualize, here's a picture of me putting the floor foam in. I staggered the foam joints with the plywood joints and put loads of PL Premium adhesive between the metal floor, foam and plywood. It holds like a champ. I had to pull out a square of the floor when I was building the shower pan and the foam pulled the paint from the steel before breaking in most places. It is rustoleum. I cleaned up the loose rust, treated the floor with ospho, primed with rustoleum galvanized steel primer then painted a couple coats of green (because green was on sale). Finishing taking up the old rubber and plywood from my floor today and planning on taking care of any rust this weekend. Based on the info in this thread I am planning on patching the holes, putting down some rustoleum, then a layer of XPS, 5/8 tongue and groove plywood, then a layer of linoleum. Forgive my ignorance, but how are you all adhering/fastening the XPS and plywood together and to the floor? I have never insulated before and am wondering how to get it all to stay together. It seems like long screws through the metal floor would be counterintuitive after I finish sealing up all the old holes. I screwed the plywood down over the XPS and through the steel bus floor after liberally applying PL Premium glue (the good stuff at the right price). However, don't do as I have done. Just glue it. The glue holds very well as was evident when I pulled a section of my floor and insulation up to make a shower pan. Glue and weight (bricks, buckets of water [don't spill]) to keep everything tight while the glue cures. The other method is to leave everything floating. I don't like that idea in a moving, shaking, rattling vehicle that may see itself upside down some day. 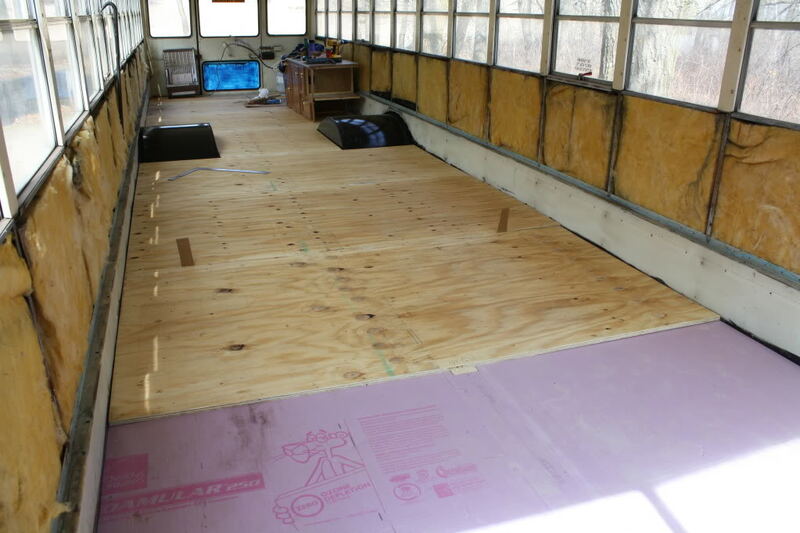 A floating floor with well anchored trim pieces along the wall to hold the plywood in place would be better.